If you were wondering how those two bulldozer attacks were able to take place so easily, so freely in Jerusalem last month, this post ought to give you a pretty good insight. How could Palestinians just on a whim take bulldozers and plow through traffic? What is Jerusalem, one big construction zone or something? In fact, yes it is. Jerusalem has been planning on, and has finally really begun construction on, utilizing a light-rail system to replace key bus routes. Essentially, it will be an electric railroad through the city. If you follow that previous link and take a look at the pictures, it is shaping up to be an absolutely gorgeous system. It's taking a long time, but if everything goes as planned, it should be a unique modern addition to an ancient, traditional city. I'm excited. For now I hate life in Jerusalem. I took a bus today that went through the center of the city; normally a 40 minute ride or so. This time with the heavy construction, nearly two hours. That was fun. I think I'll walk from now on. 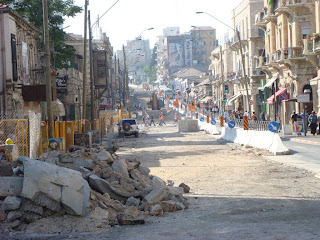 So, if you looked at the picture I posted at the top there, you'll see the main street of Jerusalem's downtown, Jaffa Street (Rechov Yaffo), totally obliterated and dug up. Just a few weeks ago this street was packed with buses and taxis. Now, and from now on with the light-rail system (whenever that actually happens), this section of the 'road' is strictly pedestrian and rail. I don't know if it's going to ease congestion. I don't know if it's going to work at all. But, right now it's certainly not working, and not just because of the traffic nightmare. How did those Palestinian men go on rampages through main Jerusalem streets with bulldozers? Easily. It seems to me, as I've walked around the past couple weeks all through Jerusalem, from the German Colony area, to downtown, to the central bus station, that Palestinian men are working with bulldozers, Bobcats, road ripper uppers, all types of weapon-like vehicles with absolutely no supervision. No foreman was in sight as I walked down a heavy pedestrian side-street today and dodged two Palestinian men in Bobcats. No supervision was to be found as some guys with a full-size bulldozer shifted rubble on congested Keren HaYesod street. I'm not going so far as to claim that Palestinians need to be supervised. I'm especially not saying that Palestinians are evil, and they aren't to be trusted. But, I have to tell you, I've never ever in my time here in Israel felt a wariness of Arabs, who are to be found everywhere in Jerusalem, like I feel walking the streets lately. I have never walked past a group of young Arab men, as I do daily, and felt anything bordering on fear or apprehension. Not until recently, that is. The strangest thing, and I want to italicize this to show you just how sickening I find this, is that I know they feel my suspicion. I have never walked past an Arab, made eye contact, and seen a sheepish look. Until recently. Walking past some of these guys working on the side of the street, no barrier or even rope between us, I have made eye contact and noticed an undeniable expression of uneasiness. I can't even put it in words. I can't quite understand what I have seen. I swore that once it was shame. Once, I swear, it was like the look of a beaten dog. I feel that two men, two savages, have stolen my innocence in a way. I've lived in Israel during a war, through numerous suicide bombings, and I've even witnessed a homemade explosive being detonated on this very downtown street of Yaffo. I've been through all that. I have no illusions of life here. Yet, you can't just look at every Arab after a suicide bombing and think 'terrorist.' In my mind and heart, from my first-hand experiences, it just doesn't work that way. But how can you not feel wary of an Arab with free reign over bulldozers in a crowded pedestrian walkway after two unprovoked attacks during a 'ceasefire' like we just saw? Should I feel bad about my instinct of self-preservation? I'm open to suggestions, concurrence, and criticisms. 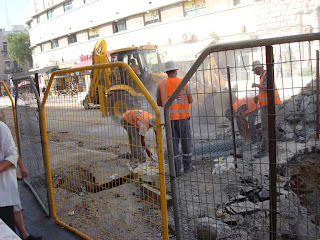 What I know for a fact is that the men I have walked by who are working on the streets of Jerusalem with dangerous vehicles are not themselves dangerous - not until an incident occurs, of course. They shouldn't have to work in suspicion. I feel terrible for them. But what can I do? 1. Is that Jerusalem? That looks terrible. The light train project of Haifa has made a mess of the city also, but not that much of a mess. I hope they finish up quickly. 2. How did you not feel that tension, before? I especially felt it during the bombings. I had a conversation about this once with someone I worked with: what it feels like when people look at you and see a potential terrorist, and what it's like looking at people and trying to figure out if they are going to explode. Yeah, it's Jerusalem - downtown Yaffo Street next to Ben Yehuda Street and Pedestrian Mall nonetheless! It's so bad that the busineses had protests in the area because their profits are falling from all the construction. I actually haven't really felt the tension before. I, as I've said, lived here during all the various attacks one can imagine. I've felt a certain amount of suspicion, and I always look at Arabs just out of a need to check my surroudings...but the level of suspicion and uneasiness has never been as strong. You see, after a bombing just seeing an Arab doesn't really make the connection. They don't have a bomb. After a bulldozer attack, however, seeing an Arab in a bulldozer certainly makes that connection. It's just a bad situation. Thanks for the pics-it's hard to believe that it's really Rechov Yaffo over there. A bit random perhaps but it somehow reminds me of my visit to the Olympics Arena in Munich. I think I felt more apprehensive and wary and at unease over there than at any of the concentration camps. Like the innocence and openness of the place is just sucha stark contrast to what took place there. So too, the bulldozers are just meant for construction and mindless digging--not for horror stories. It made sense. It's interesting to think that this same feeling could be felt in other places, without the external impetus of actually seeing symbols of the perpetrators (in this case, Arabs doing construction work). Danny, you give me that same look when I wake up on your couch. Now I'm really embarrassed. Wait, is everybody reading this? hi danni, only recently discovered your blog...really enjoying it! Dude, don't you get it? There's no such thing as a Palestinian nor Palestine. It's all based on Roman idiocy and laziness and a desire for Borg style conquest. If you're just using the term for clarity, then I suggest putting the correct word first "Arab" with "palestinian" in ( ). You do make the important good point though about how there's no difference between which passport the Arab holds. Well, I disagree in many ways. Obviously Palestinian is not an ethnicity. Palestinians are Arabs (at least when we refer to Palestinians and mean Arabs, because...). Very much so it wasn't Roman "idiocy." You can call it Roman imperialistic evil to take a people from their land and go so far to remove them and their identity as renaming the land and cities... but it's not idiocy. In fact, it works pretty damn well, apparently. I prefer to use Palestinian because I am using it as a nationality. I do believe they can refer to themselves as they want, and I'm going to use the term they prefer to use to refer to themselves. They have a claim to their own identity. Now, you may think, 'then why not use the term Palestine?' Simply enough, because their claim to their identity, in my view, ends with how they want to define themselves. They own themselves. They do not own Israel, or what they refer to as Palestine. So, they own themselves, and can name themselves as they wish, but they do not own the land - so I will call them Palestinians, but the land is Israel. And besides, I'm not talking one bit about ethnicity right now. I'm talking about nationality. Would it be any different if one of those bulldozer killers was Persian? No. So, the correct usage of term right now should be a nationality. They are trying to kill Israelis for their nationality, and they are killing because of their own national affiliation - that which they call Palestinian (of the land they refer to as Palestine). Hence, the term Palestinian can without fear be used to refer to a people that call themselves such. Idiocy meaning fighting against HaShem's will, and denying his truth, Torah. Technically (from a Western/galuth point of you), you would be quite correct here. It is wrong to propagate the lie of their name, the bastardization of Philistines, which they are not, nor even claim to be. Ararfat at one time, claimed that they were Jebsites. Then once he saw that no one was buying it, he dropped that claim. If anything they are Yishaelim, or spiritual or physical inheritors of the the status of the 7 nations who lay claim to our Land (and thus obligated to the associated punishments for such claims). The Torah's goal for us is to seek out the truth. Let us call a group the most accurate name possible. No, they don't have control of even their name. I disagree. The "nationalistic" claim is just a strategy for wiping out Jews. 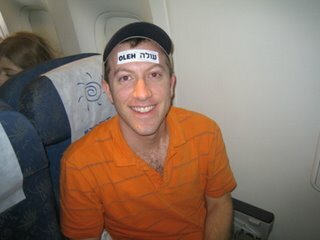 On the side of "other Arabs" who can't even stand "palestinians," they're just doing the Saudi's and others dirty work. The "palestinians" do not give a damn about this particular piece of land. No fear here, just a desire for accuracy. Very cogent arguments, but of course I remain in opposition. I do agree that it is precarious to perpetuate an incorrect term, but for the sake of conversation it often creeps in - even though I think they have a right to call themselves as they wish. Well, at least you're being lazy about it, and have your reasons (with which I disagree of course). It bothers me more when people simply accept what's most understandable because they're lazy, and can't put a clarifier in parentheses. I'd hardly say I'm being lazy. This is not, if you've noticed, a political blog. So, for the sake of having a consistent, non-provocative blog that people can read and not worry about my bias this way or that way, I use the standard term. That's not lazy. I made a choice to have an entertaining, personal blog about my life and experiences. Not a political blog. I can't believe I did that! I totally forgot the word "not." I hope it makes better sense now. I said you DID have your reasons, and meant to say you were not lazy. hi....why haven't you written any new posts!!!!!!! I'm dying to here your next installment........!!!! Thanks, Melissa. You sound more excited than my mom for this blog! Your bulldozer blog was probably the most heartfelt, expressive writing that I have read of yours. I could feel your emotional pain and distress for these innocent working people. Danny, you revealed so much of your inner self and your character through that blog. I am proud of you. I wish everyone could get along; but, does that surprise you? PS: No one is more excited to hear from you than your mom. Jeez, my mom can be so cheesy.